Lowest toxicity art solvent available, recommended for a safer studio environment. Diluent and solvent for oil colours. Highly refined odourless mineral sprits (OMS). 100% purity. Alternative to traditional artists’ solvents reducing exposure to the more harmful compounds associated with turpentine and general petroleum distillates that contain acetone & toluene. Completely odourless. Leaves no residue after evaporation. Permissible Exposure Level (PEL): 300 parts per million parts. To be used as a diluent when used in small quantities with oil colours. Langridge Solvent 75 may be added to oil colours, drying oils and oil mediums in small quantities, used to clean dried paint films and to clean brushes and painting equipment. Solvent 75 can be added to artists’ drying oils to add extra fluidity. Extreme care should be taken, however, in diluting purely with solvent as its over-use, like all artist’s solvents, can easily underbind paint and lead to a dull, dry lifeless film with potential for dusting or flaking off. Solvent 75 has a low solvent action (KB value) making it a highly useful for gentle removal of surface dirt from paint films (Langridge does not recommend thorough cleaning, including varnish removal, of artworks except by a trained conservator.). Because of its construction, Langridge Solvent 75 cannot be used for the home manufacture of artists’ varnishes (natural or synthetic). Damar resin cannot be dissolved in Langridge Solvent 75 or any petroleum distillate. For cleaning brushes Langridge recommends the use of brush cleaning units or containers which have an airtight lid. Reducing exposure to solvent fumes is to advised at all times as well as preventing evaporation of solvent in the container. Because Langridge Solvent 75 has a Permissible Exposure Level (PEL) of 300 parts per million parts of air, far higher than other artist’s solvents, opportunity to exposure of harmful fumes, in comparison to traditional solvents, are dramatically reduced. Associated issues with prolonged contact with traditional artists’ solvents such as dermatitis, skin and respiratory organ irritation, headaches, etc. can be dramatically reduced or removed by the use of Langridge Solvent 75. Langridge still recommends the use of good studio ventilation (e.g. open windows) to increase airflow with preferably a properly installed exhaust system. Because Langridge Solvent 75 has a Flash Point of 75 degrees C (167 degrees F) it is deemed as NON-Dangerous Goods and may be transported by air, road and rail transport as set out by regulations of the International Air Transport Association (IATA). Artists wishing to have a painting with a matte reflective quality should use a Matte Medium added to their paints or apply a Matte Varnish once the painting is finished. 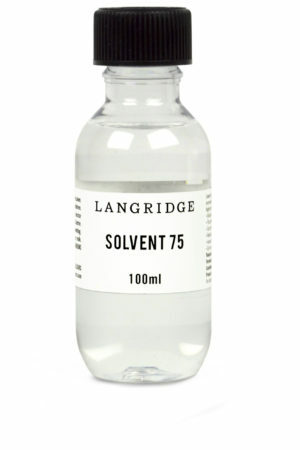 Langridge Solvent 75 is a clear and transparent liquid with no odour.